Odyssey favorites – weekend delights from near and far. Saturday and Sunday Brunch beginning at 9:00AM is a favorite of many in our Odyssey community. We roll out special brunch offerings like our Bacon Sampler – yep, it’s bacon and favorites like everyone’s secret indulgence, Biscuits & Gravy. Of course, what would Brunch be without Mimosas for all? Our exclusive brunch special. Odyssey grabs hold of Gastropub status right here with our Lunch and Dinner fare. Tamari BBQ marinated chopped steak in lettuce cups with pickled carrots, micro cilantro, and crispy sambal onions. Local sausages and pretzels with pickled red onions, horseradish mustard, and roast garlic parmesan dip. Crispy fried brussels sprouts with lemon balsamic reduction and shaved parmesan. Vegetarian. Gluten-Free. Crudo of salmon with caper/lemon dressing, avocado, scallion and naan. Consuming raw or undercooked meats, poultry, seafood, shellfish, or eggs may increase your risk of foodborne illness. 3 bacon, 1 house smoked pork belly with smoked maple syrup on the side. Gluten-free. Cornmeal crusted dill pickles with ranch. Tomato, basil, red onion, garlic, balsamic drizzle, feta cheese, red wine vinaigrette. Vegetarian. Glazed salmon with grilled squash and a crispy sweet potato nest. Gluten-Free. Andouille sausage, blackened shrimp, spicy trinity/tomato Cajun rice, and crostini. 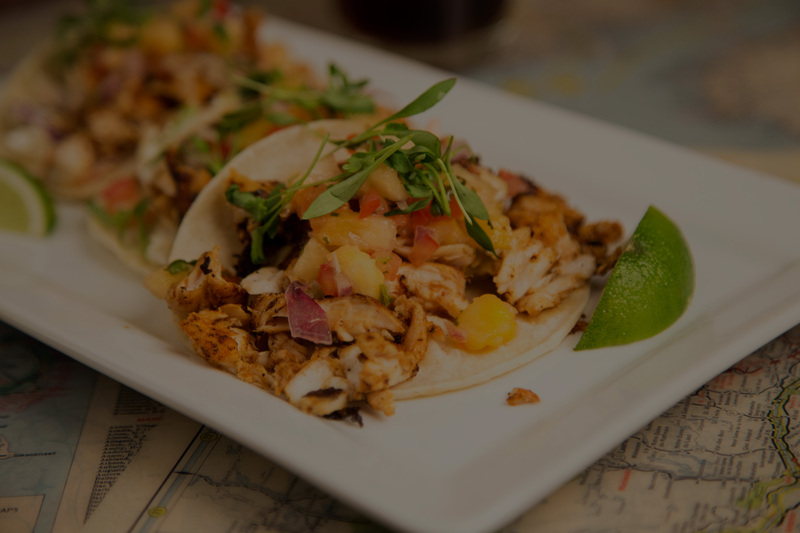 Blackened Mahi Mahi and lime slaw fish tacos topped with fresh pineapple salsa in corn tortillas. Chili rubbed steak, jalapeños, chimichurri edamame salsa, avocado crema, citrus hot sauce, topped with microgreens. Gluten-Free. Mahi Mahi fried in 5-spice beer batter with sweet chili tartar sauce and slaw. Tender, thin sliced corned beef, sauerkraut, horseradish mustard, Russian dressing, and swiss on marble rye. Roasted mushrooms and red bell peppers, squash, caramelized onion, arugula, tomato, basil aioli, and goat cheese on naan. Vegetarian. Honey bacon, lettuce, tomato, onion, avocado, and guajillo aioli on marble rye. With fried cotija cheese, guacamole, jalapeno bacon, and fresh jalapenos. Kale and shaved brussels mixed greens, house pickled beets, grape tomatoes, toasted almonds and parmesan with whole grain mustard and honey vinaigrette. Vegetarian. Gluten-Free. Charred romaine tossed in caesar dressing topped with red onion, grape tomatoes, croutons, and red chili flakes. Gluten-Free. With vanilla ice cream, caramel sauce, almond, & bacon brittles.